Parrot’s history in aerial drones dates back over 4 years ago with the original unveiling of the AR Drone. I first took notice in late 2011 but never made the investment. The AR Drone 2.0 was introduced in January of 2012 at CES and I was looking forward to it for months. When it was finally released, I was in a different situation and not able to buy one. Fast forward to CES 2014, where Parrot unveiled two new units under a Minidrones banner. The Rolling Spider, a small aerial drone and the Jumping Sumo, a ground unit that can leap in the air. The Rolling Spider was delivered to my doorstep first, so I had the chance of creating its review before I receive the Jumping Sumo in a few days. Since I’ve been anticipating an aerial unit for so long, the Rolling Spider initially appealed more to me. After performing a quick photo shoot of the unboxing, I was prepared to take my first test flight. The Rolling Spider is symmetrically 3 3/8″ to each side from the center of the propellers, and sits 1 1/8″ off of the ground. It has a tough rubber chassis on the outside and a soft plastic white casing shell. A sticker sheet is found inside the box with 12 different mouth pieces to help customize it to your style. The eyes will light up green when the unit is on and ready to fly. They will flash red while charging or when connected to a computer. Setting up the Rolling Spider was easy. It lit up right after inserting the battery. The Freeflight 3 app on my iOS device (also available on Android) found the drone and connected immediately. The gyroscope controlled layout is selected by default. It was a little tough to use on iPad so I switched to the joystick layout. It is much easier and also turns on the iOS camera so you can record the drone during flight. The Rolling Spider has a built-in camera on its base that is used for balancing, landing, and can also take photographs via the app. The image resolution is not the best but having the ability to take pictures 40 feet in the air is pretty impressive. I started by practising indoors. The app features a take-off and landing button that will automatically lift it about 2 feet in the air. It will hover until you take control and begin navigating. There is a small learning curve to become accustomed with the directional flight controls. 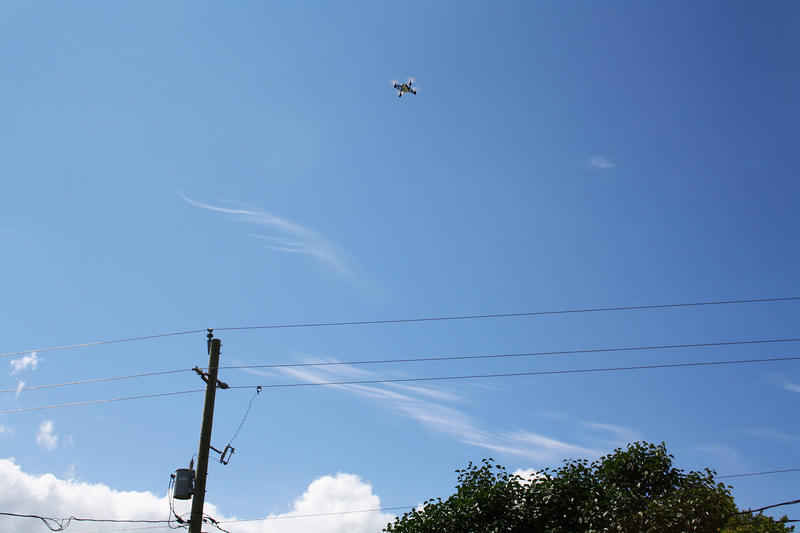 Turning and strafing is relative to where the drone is oriented. If the drone is facing you, moving left on the joystick will be the drone’s left, which will be your right. The sensors will adjust in real-time and fly upwards if objects are too close underneath, such as a table or person. 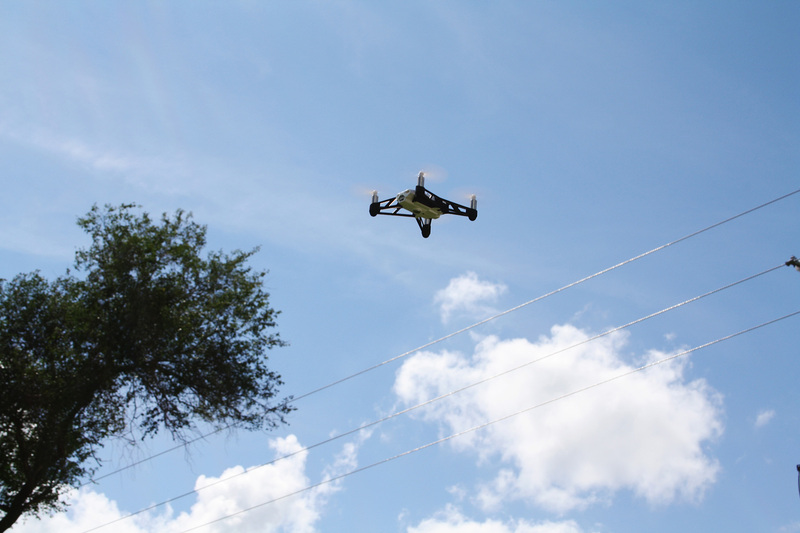 During my outdoor tests, I was able to pilot the Rolling Spider approximately 35-40 feet in the air. The wind did affect its balance during take-off and at peak heights, which is understandable being such a light unit. Once it was in the air and stabilized, flying around was exciting and enjoyable. It is rated at 18kmh/11mph with a range of 66 feet, or 20 meters. The battery life is set at 6 minutes with the rolling cage, and 8 minutes without of consistent flight. While this seems low, I was able to get a few minutes more. Charging time is just over an hour, rated at 90 minutes. This originally swayed me away from the larger AR Drone. If battery technology is able to significantly improve in the next few years, it will revolutionize these devices. Even having ~30 minutes would be a big difference, especially for the larger drones. 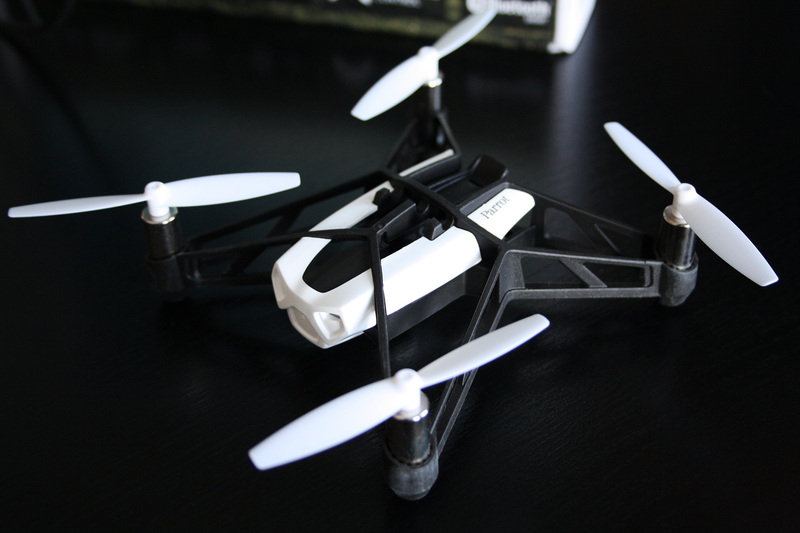 Priced at $119 ($99 in US), it is a great way to become acquainted with aerial drones. This was my first experience at flying and it has been a lot of fun so far. If anything, it could be used to assist in gaining interest towards larger units for the average consumer. Those who may not feel comfortable spending $300+ on a full size drone can try out the Rolling Spider and see if it is something they would enjoy. Parrot has a brand new flagship aerial drone that I am looking forward to coming out later this year called the Bebop. It features a 1080p camera and many improvements. The Rolling Spider is a warm-up for this new drone. 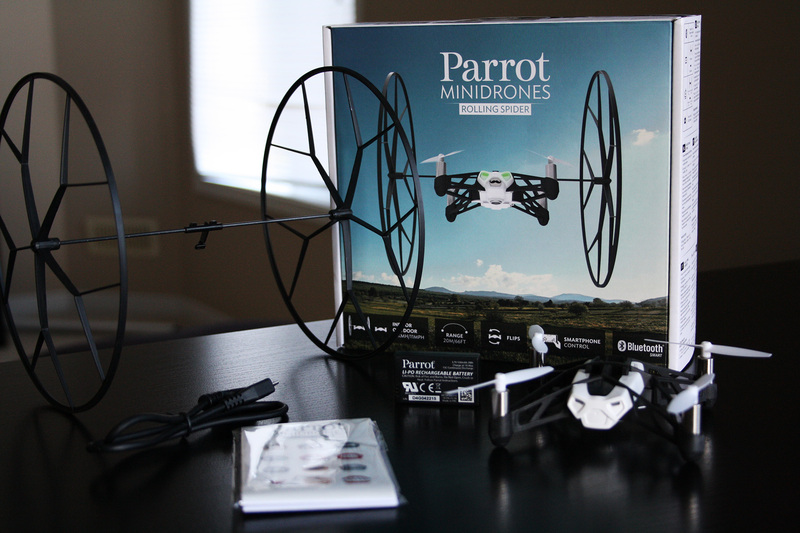 Click here for a review of the other half of the Minidrones duo, Parrot’s Jumping Sumo.